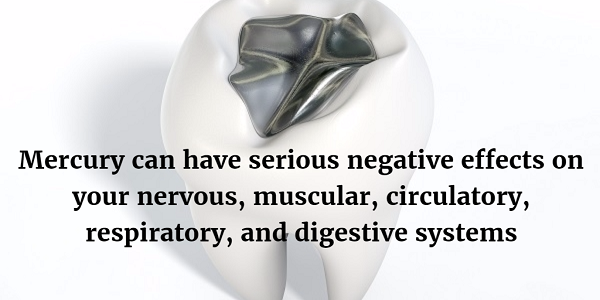 In our practice, we do not use any mercury/silver fillings, also known as amalgam fillings. Most people and even dentists don't realize that these fillings are composed of 50% mercury. It is also important to note that mercury is the most toxic nonradioactive substance on earth, and since 50% of the amalgam composition is mercury we do not feel this restoration is warranted as a dental filling. Published research shows that mercury is more toxic than lead, cadmium or arsenic. The World Health Organization has concluded that dental fillings are responsible for more mercury in the body than all other sources combined. We feel that no amount of mercury exposure is safe or harmless. So in our practice we use safe protocols to remove these fillings. Utilizing an independent mercury vapor unit (Dent Air Vac) designed specifically to remove and filter toxic mercury vapors away from the immediate breathing area. This is used solely during the mercury removal process. Utilizing an efficient suction system that contains the amalgam particles and mercury vapor. Isolating the involve teeth from the rest of the mouth with non-latex rubber dam to prevent ingestion of particles. Applying copious amount of water, to minimize heat generation and subsequent mercury vapor. Removing the amalgam in large segments to minimize mercury vapor generation. Provide an independent airway mask for a mercury free source of oxygen. Provide an oral detox rinse which binds and eliminates mercury from the mouth. Protect the environment by collecting old mercury particles and safely dispose of them with recycling equipment. Protect our team from exposure by using a powerful air filter designed to filter out any particles in the air. Provide a disposable protective gown during the mercury removal process to minimize contact with your clothing and body. We also want to be clear that we make no claims regarding health improvements based on removal of these mercury/silver amalgam fillings. Only with a careful study of blood chemistry can one determine the body's burden from years of mercury exposure. Sweden and Denmark have already banned the use of mercury in dental amalgam fillings, citing health and environmental concerns. Germany and Austria have some restrictions of dental amalgam use. It is permitted for the general population but it is not permitted for pregnant women or people with kidney problems. The United States has not put stringent measures like these in place. However, NYC Smile Design has taken the first step to protect patients, offering only porcelain fillings containing no mercury. For more information about our safety protocols and the materials we use, please call 212-452-3344 or contact our New York office online today.